As Christmas is nearing, my heart is full of delight to see the colorful season decorations everywhere, I can feel the Christmas spirit in the air. Reminiscing the joys and fun celebrating Christmas during my childhood days and now as a mother turning over the tradition I grew up with to my kids. bamboo parol project in school. We are both happy to see the result of his creativeness. Yearly, we adorn our Christmas tree with different styles and motifs, this year we made it gold and silver. 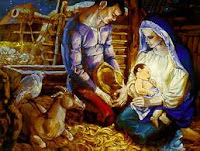 The Belen, nativity scene is usually seen inschools, malls and even in offices, to remind us why we are celebrating Christmas. Mistletoe is commonly decorated in offices, is also said to be a sexual symbol, because of the consistency and color of the berry juice as well as the belief that it is an aphrodisiac, the “soul” of the oak from which it grows. 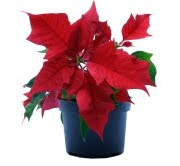 I remember when I was still an office employee, I used to avoid walking under the mistletoe. Everyone in the office is always on the watch and monitoring the mistletoe passers. One legend states that a couple who kisses underneath mistletoe will have good luck, but a couple neglecting to perform the ritual will have bad luck. Specifically, it is believed that a couple kissing under the mistletoe ensure themselves of marriage and a long, happy life, while an unmarried woman not kissed under the mistletoe will remain single for another year. During my childhood days, my Grandpa always tells us to put our Christmas stockings near his bedroom with names on each stocking on Christmas eve so that we will not give Santa Claus a hard time looking for our stockings (lol). This is one tradition I am missing so much, for our dearest Santa Claus (our grandpa) is already in heaven many years ago. In these times, I wonder who are still practicing the traditional Stockings, for it was replaced with the Christmas wish list. Children nowadays, voice out what they want for their Christmas presents unlike before that as a child, I am contented and happy with what I will receive on Christmas. 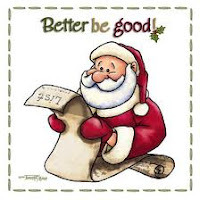 The tradition of sending Christmas card greetings to friends and family, is still practiced although it is done electronically because of the computer technology. by the host family (even though they are already full or bloated!). 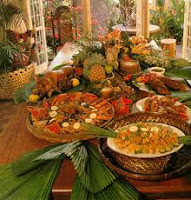 Among the typical foods prepared in the Philippines during Christmas are: lechon (roasted pig), pancit or pasta dishes, barbecue, rice,cakes (Western and native rice cakes), lumpia, and other special dishes which we really take time out in cooking the whole day. There is also an abundance of beer, wine, and liquor, which makes the celebration of Christmas indeed intoxicating! In general, the center of a family's Christmas gathering is always the lola or lolo, the endearing term used for a family matriarch or grandmother and patriarch or grandfather, who are deeply respected, highly revered, and always present. Filipinos remember how their lola and lolo had their children form a line and step up to receive a small gift of some coins. The older the child, the more coins he or she receives. Christmas day is a popular day for children to visit their uncles, aunts, godmothers, and godfathers. At each home they are presented with a gift, usually candy, money, or a small toy. Food and drinks are also offered at each stop. It is a day of family closeness, and everyone wishes good cheer and glad tidings. Hi mommy joy dropping by from Pinay mommy club. feel ko na ang spirit of xmas dito. merry christmas! hello Shydub, hihi, thanks for dropping by, oh ye, we have to feel the Christmas spirit lalo na mga kids natin di ba?